Enjoy the top 1 famous quotes, sayings and quotations by Alex Bell. Believe it or not, some of us have piercings and tattoos and dye our hair because we think it looks pretty, not for any deep sociological reason. This isn't an act of protest against cultural or social repression. It's not a grand, deliberately defiant gesture against capitalists or feminists or any other social group. It's not even the fashion equivalent to sticking two fingers up at the world. The boring truth of it, Gabriel, is that I don't dress like this to hurt my parents or draw attention to myself or make a statement. I just do it because I think it looks nice. Disappointed? Want to see more pictures of Alex Bell quotes? 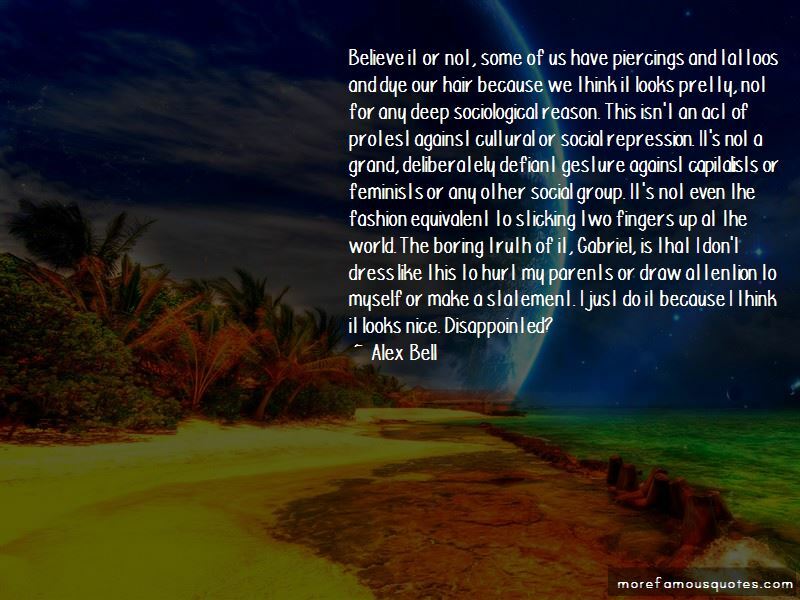 Click on image of Alex Bell quotes to view full size.